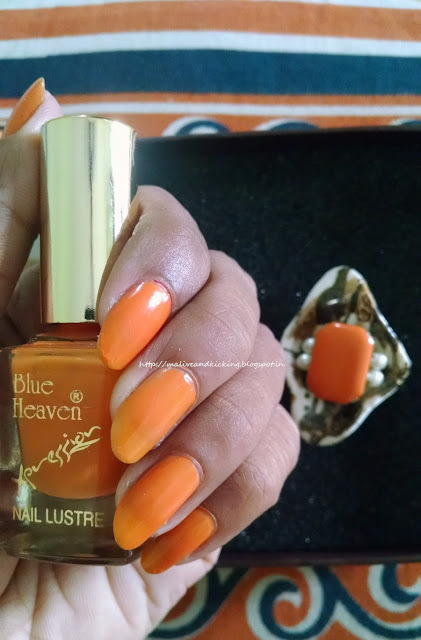 Blue Heaven Cosmetics sent me two exciting nail paints from their Xpression range. These nail paints provide intense color to nails. The special features are non bleeding & non feathering formula that stays for days and no chip off. Butyl Acetate + Ethyl Acetate + Isopropyl Alcohol + Tolune + Nitrocellulose + Resin + Steralkonium Hectorite + Dibutyl Pthalate + Camphor + Pigments And Pearls. 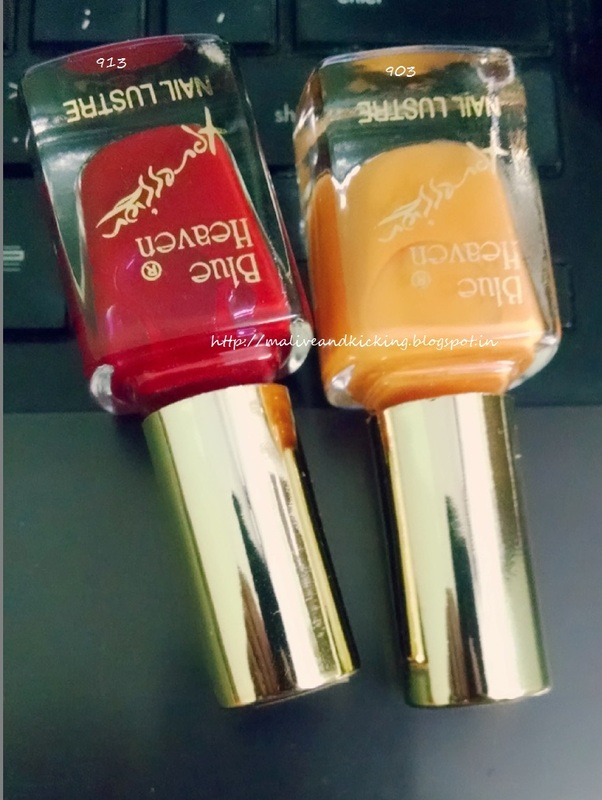 The Xpression range of nail paint, which are referred as Nail Lustre by the brand, comes in a squared edged glass bottle. The transparent bottle lets you see the color and remaining quantity in a glance. 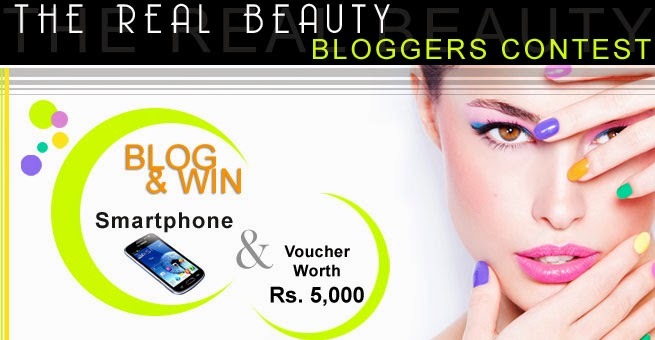 The price, usage instructions and Expiry date is printed on either side of the bottle. The golden cap shines in the bottle neck that grips tightly and you would find the Shade no. on the top of the cap. The applicator brush is made up of properly shaped bristles which gives full coverage in just one swipe except corners of nails. I found it comfortable to hold and use. 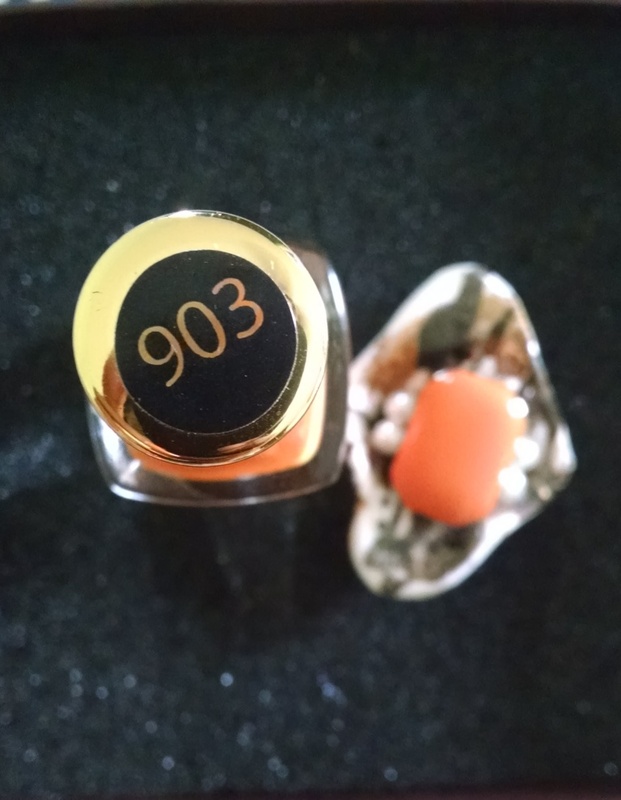 As mentioned above, I got 2 lovely nail paint shades in 903 and 913. 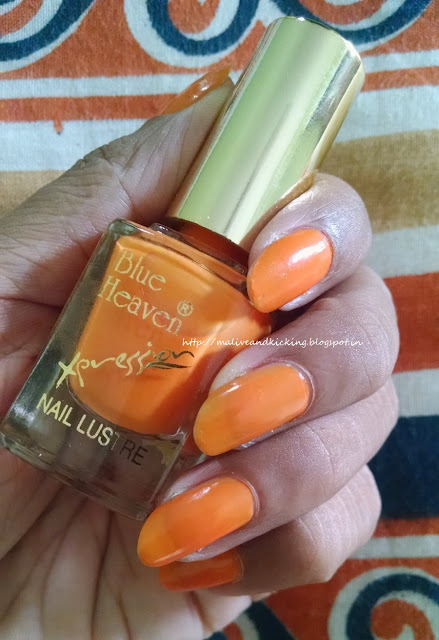 Blue Heaven Xpression Nail Lustre - 903 is a bright orange color with mild cream finish as seen from the bottle which I found 'shockingly bright' in the first glimpse. But the temptation to experiment with new shade insisted me to apply it without any waiting. The nail paint is bit runny in consistency and brings out the actual opaque finish after 2-3 coats only. It dries up quickly and gives glossy finish without a top coat. The staying power is also decent as I can see my nail with no chip-off after 3-4 days of application despite all household work and washing my hands uncounted number of times. 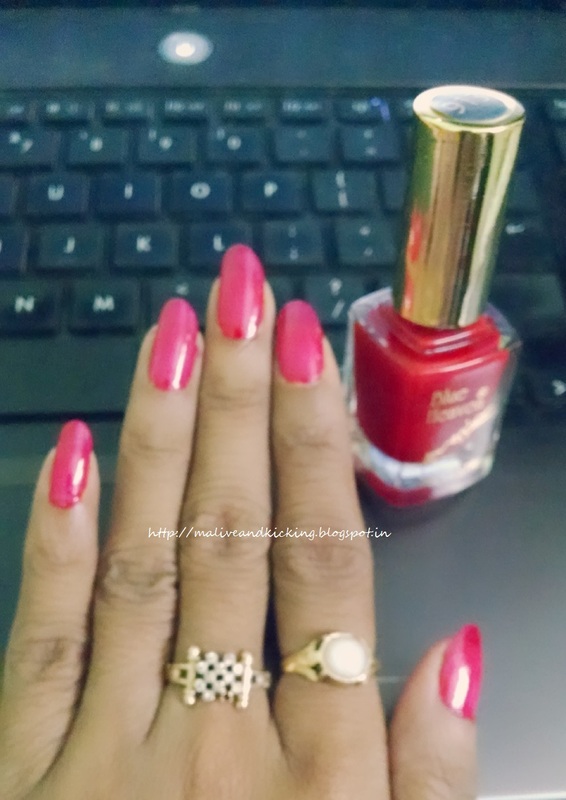 I am feeling more confident to try such vibrant neon shades on my dusky complexion now that have brightened my summer look and gave a boost to my mood and spirits :) Now I know why is it a hit among youngsters these days ..
Blue Heaven Xpression Nail Lustre - 913 is one of the evergreen shade of fuschia pink that can be a favourite of most women and collegiate gals. The consistency of this shade is similar to other shade I have used. It seems squeaky in initial coat but smoothen as you swipe one or two extra coats. 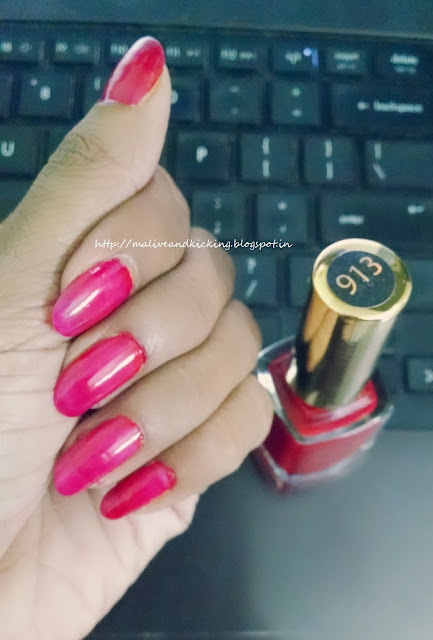 The color looks something on red tone in the bottle, but gives a different summery fresh appeal on application. 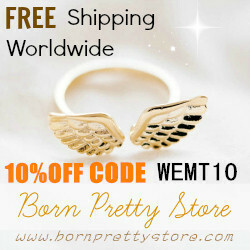 It will suit all skin tones making your hands look fairer. This is the kind of shade that need not match with your outfit exactly, but will add up its glow in contrasting colors with broad variations. 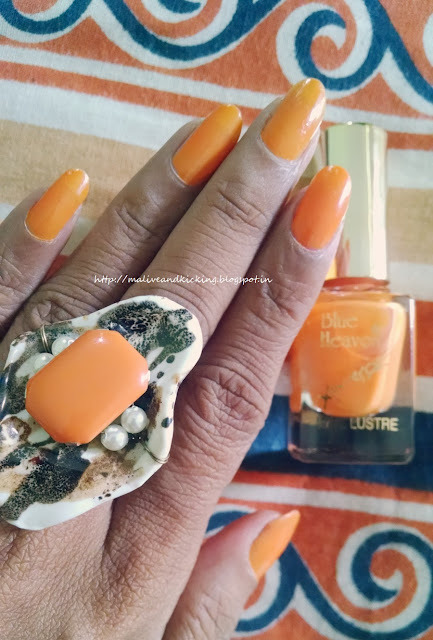 All the shades of Blue Heaven Xpression Nail Lustre can be bought from Flipkart, Jabong, Shopclues etc. Tell me which one did you like more? 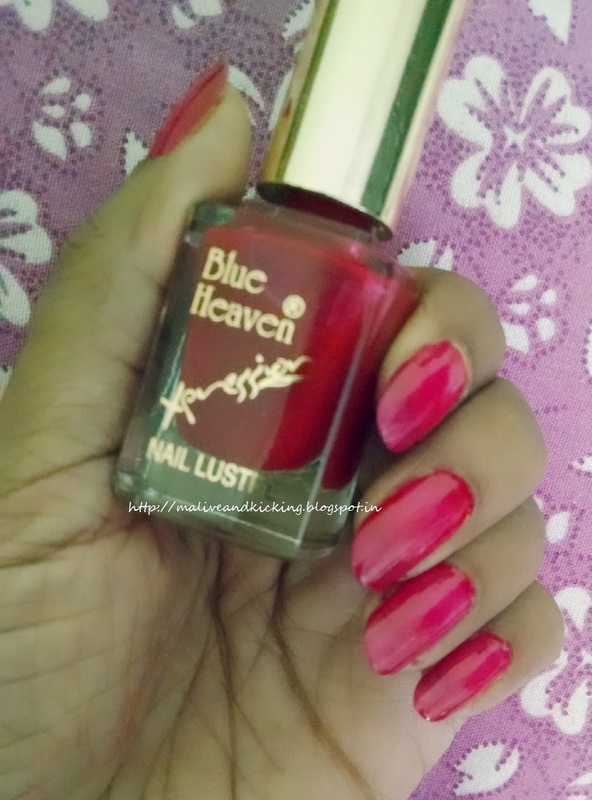 Do recommend me if you have tried any other gorgeous shade of Blue Heaven Xpression Nail Lustre..